Memories of a Nidan: Ochoa Recap 4: Gone is the Goju of Yesteryear? To equate the social and cultural realities of a dojo today with those of a sensei's garden dojo in the late 19th Century is absurd. And yet from these small, mud-packed gardens came what we today call Okinawa Karate, in all its myriad styles and variations. Does the present syllabus faithfully reflect the old Naha-te and Shuri-te forms from which they sprung? What are the ultimate origins? To whom do we owe the katas we practice today? Do the many kata variations and the different style katas signify that there is no airtight tradition? And, if this is so, can we vary the katas we know or invent new ones entirely? In short, what is tradition? All these questions in the 1970's in the Ochoa Dojo really were irrelevant. There was no martial arts scholar in our midst to shed light on these and other sundry matters. An American guy talked to an Okinawan guy who sent a Japanese guy to teach Puerto Ricans the Shoreikan style of Okinawa Goju-Ryu Karate Do. Did we know we were being taught a particular syllabus distinct from others? Yes, but Goju was what we learned. Nuances and sublteties of stance, whether one knuckle or two, overhead or from the shoulder, slide or simple step, kiai here or there, etcetera, varied for me from teacher to teacher within Goju. So what traditions we learned were from the dojo. The dojo was, I guess, our tradition. Ochoa, in particular, was mine. In the photo to the right I recognize the shiko dachi stance, little else. And yet the look and attitude are recognizable in my tradition. 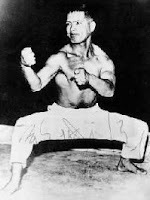 But the little details in the stance, the hook of his wrist, the placement of his feet betrays another Okinawan style. No still-shot of a shoreikan kata would reveal this moment. The words are all there in a different order, although it is a sentence in the same language. Toguchi was in all my teachers, all up and down the scale whether they migrated to other styles or set up their own. 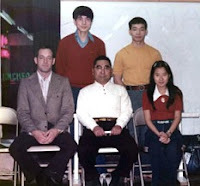 In this historic photo all my schools are represented: Toguchi's (center) Shoreikan, Kimo Wall's (to the right of Toguchi) Kodokan, and Kow Loon Ong's (standing to the left of Toguchi) Chi-I-Do. And all these sensei passed through Ochoa, physically and spiritually. I've always been one man away from Toguchi and we all know who he was one man away from. So tradition is a funny thing with regards to Ochoa, we were steeped in it without even knowing. But I think that regardless of the lack of hard knowledge about the dojo's heritage and lineage from a historical perspective, one sensed a belonging that was somehow transmitted to all of us at Ochoa. 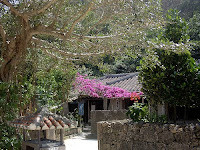 Ochoa for all who were there was our little Okinawan village, living now only in our memories that erases all its shortcomings. All of us have migrated from Ochoa years ago and generations of black belts have trained in other dojos. The Ochoa "clan" is now in its late fifties to early 60's, a lifetime. These are the hard facts. When I read how many are so flippantly ready to vary their styles I wonder about their allegiances, what brought them to contemplate the possibility of changing the very core of what made them, whatever style that might be. I guess there are very good reasons to do so, only I find it impossible in my case. I've been in the village too long and now that I lost it my Goju katas are all I have.